Cooking and menu planning are a blend of science and art. While the science of nutrition embodied in diet planning and cooking methodology, if properly understood, makes food a source of positive health, it is an art to see that the dishes are attractive, palatable, affordable and yet nutritious. The book "Count What You Eat" differs from the usual recipe books in that it provides only a wide range of recipes suitable for a variety of tastes and incomes, but also the calorie, protein, carbohydrate, fat and mineral contents per serving. Vitamins have been left out, because of the variable extent of cooking losses that occur. However, since the table of nutritive value of foods provided, includes vitamin contents of raw foods, it can be referred to for deriving the vitamin contents of the uncooked ingredients in a given recipe. A discussion on the different methods of cooking, with relevant "Dos and Don'ts" follows the introductory remarks regarding the scope of the book. Inclusion of recipes for ready to eat condiments and some chutneys provides additional flavour and value to the publication. The book, we hope, will be of use not only to dietitians working in institutions or hospitals, but also to housewives and others who wish to count the calories and nutrients derived through their diet. Traditionally, many methods of cooking are in vogue. These methods differ from region to region and from household to household. Similarly, the same dish may be prepared using alternative recipes with different ingredients. Cooking of food has advantages as well as some disadvantages. One of the important effects of cooking is on the nutritive value of the preparation. It is therefore essential that the housewife is conversant with various methods of cooking and their effect on nutritional qualities of foods. She should also be aware of the method suited for any particular preparation not only from the palatability point of view but also with respect to wholesomeness and nutritional value. This publication provides basic information on different methods of cooking which housewives may find useful. A glossary of terms commonly used in food preparations is also given for reference. Apart from the above, the book contains several recipes which can be used in health and disease. These recipes are classified based on the main ingredients as cereal, pulse, animal flesh or eggs. Some sweet dishes, puddings and desserts are also included. The ingredients for each recipe are listed in terms of quantity (weight in grams, as well as in measures and/or number) used. 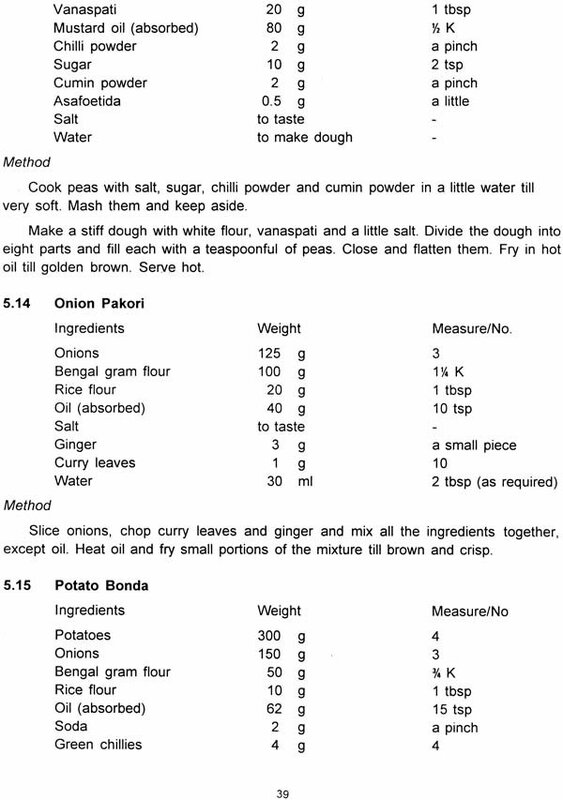 The total weight of the cooked food and the amount per serving (weight and measure) are indicated in the Table at the end of each chapter. The measures used in the recipes are teaspoon, tablespoon and bowl (150 ml). Unless otherwise mentioned, any fat can be used for cooking of these recipes. Quantities of chillies and other spices can be altered according to taste. Amount of oil used in the seasoning, specially of pulses, can be reduced, if so desired. In the case of deep fried food preparations, only the quantity of absorbed oil or fat is indicated in the list of ingredients and the nutritive value is calculated on this basis. However, the actual amount of the oil required for frying will be more, depending on the size and depth of the vessel used for frying, as also the quantity or number of items to be fried. All the preparations included here were actually cooked and tasted by those hailing from different parts of the country. The nutritive value of each preparation (per serving) is calculated using the information on dietary nutrients given in the publication 'Nutritive Value of Indian Foods' (1982). The vitamin profiles of the preparations are not given because, without actual analysis, it is not possible to assess their vitamin content on the basis of raw foods since some of it may be lost during cooking/processing. These values given in the table can be used provided the suggested amounts of ingredients are used and serving is of the same size. Apart from the housewives and lay persons, the book can be used by physicians for recommending therapeutic diets or any other specified diets, and by dietitians and research workers as a ready reckoner for calculating nutrient content of diets of different population groups during diet surveys etc. With the increasing awareness of the benefits of good nutrition, there is need for providing such information on many more recipes in common use in different segments of our population. I am extremely grateful to the former Director, NIN, Dr. B. S. Narasinga Rao, for sparing his valuable time and giving his constructive suggestions. I also would like to place on record the contribution of Mr. V. Ramadas Murthy, Research Officer, who has taken enormous interest in editing and finalising the format of this book.